A new website that's accessible. People with disabilities represent the largest minority, roughly 15 percent of the United States population. The unemployment rate for individuals with disabilities is 11.3 percent. It’s more than double that for people without disabilities. So why the continuing gap of employment for people with disabilities? It is a difficult question that we need to be asking as a unified cross-disability community. The struggle is real for job seekers with disabilities. Focusing on employment issues affecting people with disabilities who self-identify we see we have a lot to do. Current approaches in our communities are good but not good enough. For example, there are various online job boards that have been created by service providers in your community. The job boards typically require you to apply to the linked employers’ sites. And most job boards are not accessible because they are usually designed for applicants who are not people with disabilities. And not enough employers have initiatives for hiring of qualified people with disabilities. When asked, many small businesses would consider recruiting people with disabilities but don’t know how to access such talent. That’s why DylanListed.com was created in 2012 by founder Dylan Rafaty, a person with a disability. It isn’t just another job board. It’s a recruitment tool that directly supports businesses that want to access and recruit qualified people with disabilities who self-identify. On DylanListed, job seekers can apply to a job directly from the site. And they care about the future talent pool of job seekers with disabilities, such as high school students in special education classes. They have the tools to help them do career and interests exploration, see events and training opportunities and capture their skills in a virtual resume. 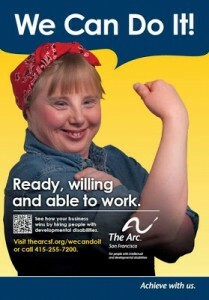 Now that’s a new kind of engagement for job seekers with disabilities!